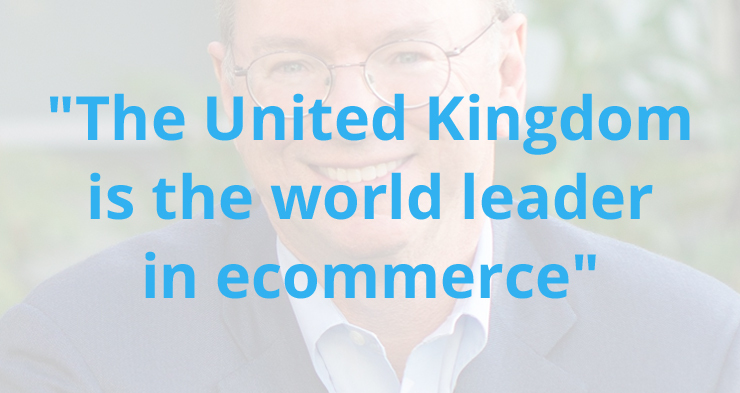 Google's Eric Schmidt: "UK ecommerce far ahead of US"
January 5, 2016 by Ecommerce News. About Interview with tags The United Kingdom. 8144 views. Eric Schmidt, executive chairman of Google’s parent company Alphabet, has shown to be very enthusiastic about the ecommerce industry in the United Kingdom. The former Google boss thinks the United Kingdom is the world leader in ecommerce. Schmidt spoke to BBC Radio 4’s programme Today and said there is no reason why a hundred billion pound tech company couldn’t be launched in the UK. He also claimed the UK is the leader in ecommerce in the world, far ahead of the United States. “Britain has every aspect to build billion pound, ten billion pound, hundred billion pound companies. It has the right regulatory environment. It has got the right role within the European continent. Just look at the ecommerce plays and service plays that are now happening in London”, he told the radio programme. “Europe is pushing on a European digital single market and in the timeframe of a British entrepreneur building a small start-up, the Europeans will figure out a way of building a single digital market for his products.” According to Schmidt, there were no barriers to launching a European-scale corporation that is larger than a US-scale corporation. One important factor which could decide whether a startup can be successful is, according to Schmidt, the product. He said the only thing that matters is the product quality. This and his notion that lean distribution models are replacing big marketing and advertising budgets should help aspiring startups. It has become easier to successfully start and run a startup and compete with more established companies, Schmidt argues. “If you have three people and a vision, you should be able to raise funds from friends and family, crowd-funding and early venture groups”, he added.